30cm x 40cm custom, weatherproof football corner flags supplied in seven different colours, with vector image printing also available. Custom flags are designed to fit 25mm or 50mm corner flag poles. Available individually, or in packs of four or six. Whether you're after a pack of 1, 4 or 6 flags for multiple pitches, you can chose the pack size right for you! 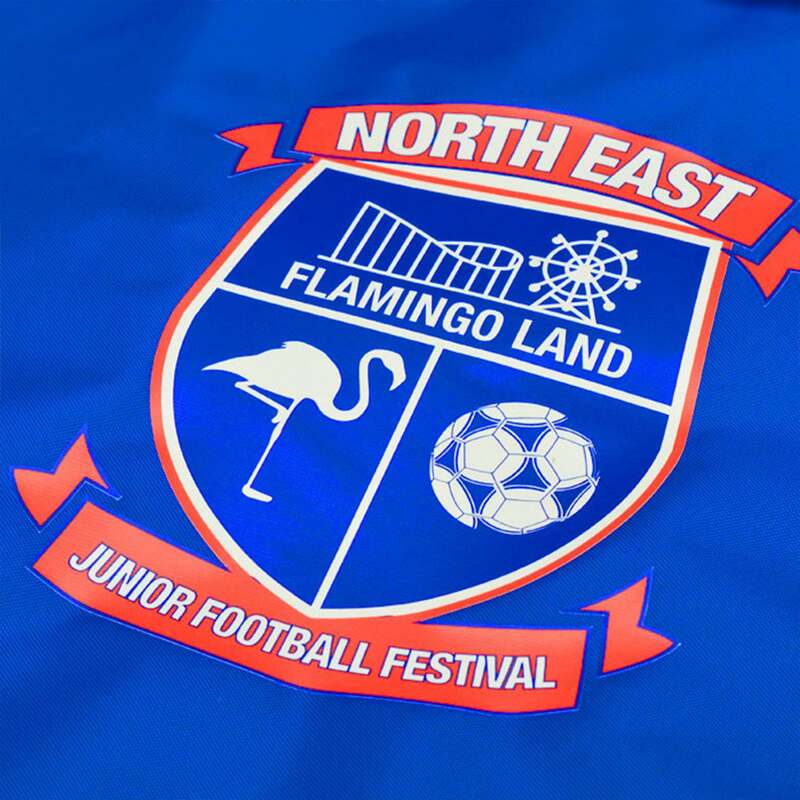 Do your badge justice with the use of our high quality vivid printing techniques that give your football corner flags a professional look. 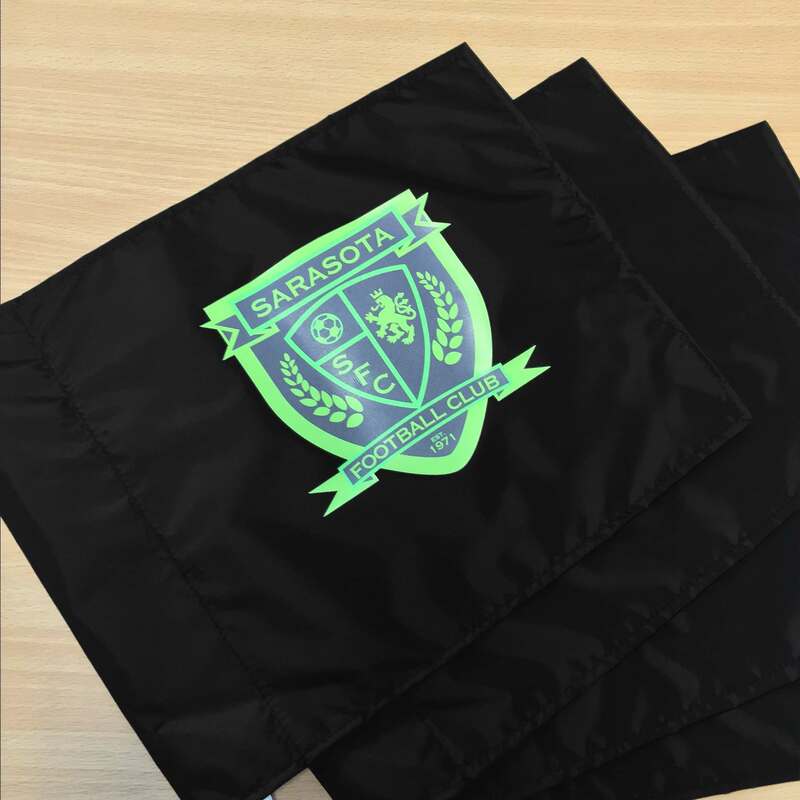 The flags are designed to retain their quality even in bad weather, which means they can be left in place season after season. Create a homely feeling within your stadium with these custom corner flags, available in seven colours. Each flag is 30cm (11 inches) x 40cm (16 inches) and can feature a printed vector image of your choice. Custom football corner flags are sold individually or in packs of four or six. Corner flags are 30cm (11 inches) x 40cm (16 inches). High quality image printing available. Seven different coloured football corner flags to choose from. Sold individually or in packs of four and six. For corner flag poles of any diameter. 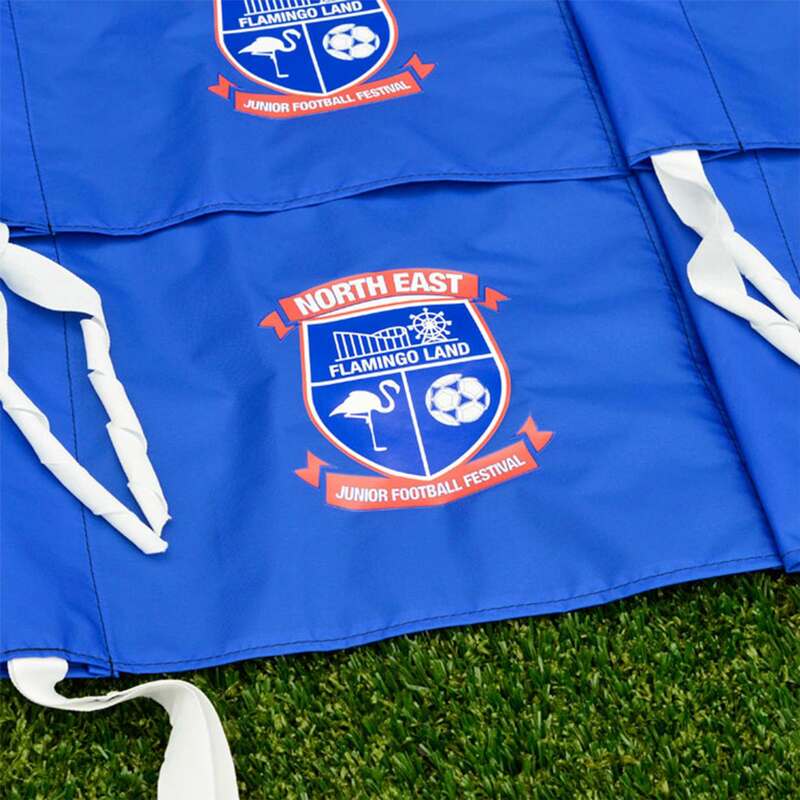 Give your 25mm or 50mm thick football corner flag poles a new lease of life with these custom printed, weatherproof nylon flags. Choose from seven different attractive colours which will compliment your sports teams home kit. The seven available colours are red, yellow, green, black, sky blue, navy blue and white. Fly a high-quality image of your team’s badge or sponsor on each of your corner flags to add to the atmosphere of your home stadium. Whether you are replacing a single worn out corner flag or reinvigorating your entire set up there will be an option for you. Manufactured from The premium football corner flags are available individually or in bundles of four or six. Each flag measures 30cm (11 inches) x 40cm (16 inches) helping all 22 players on the pitch and the referee see where the football was kicked out. If you would like to an add an image to your premium corner flags, then please email us at enquiries@networldsports.com with the following information. Your order number (sent via email). A high-resolution vector image of your design. Please Note: Flags will take 5-7 business days to be delivered once confirmation of image rights is received. Colours available: Red, yellow, green, black, sky blue, navy blue and white. Is the emblem on one side or both sides of the flag?